Ever since 1984 when Apple launched the Macintosh with its once only TV commercial (created by Ridley Scott) and screened it at the Super Bowl, marketers around the world have envied the creative budget and freedom the Super Bowl TV commercial phenomena offers. 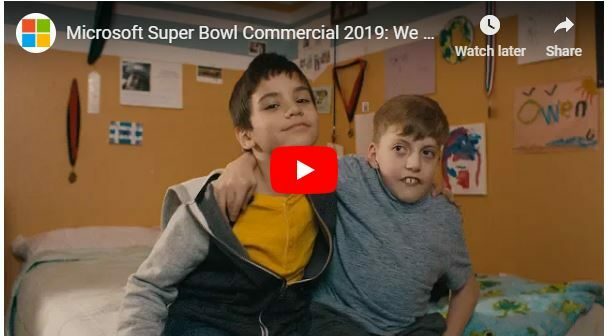 So, on Monday we all watched and waited for the best TV ads in the world – and were disappointed. Generally, they were average and clichéd. You can see them HERE. The two exceptions were Microsoft and the Washington Post. Both worth watching. Microsoft was great because of the product they were launching; the execution wasn’t out-of-the-box but the product initiative was given the relatively low return on investment. Watch it HERE. The Washington Post ad is narrated by Tom Hanks and “described the role of journalists as eyewitnesses and gatherers of facts,” as well as explored “the profession’s larger importance to society.” Watch it HERE. The Washington Post is now owned by Jeff Bezos, the founder of Amazon and the world’s richest man. 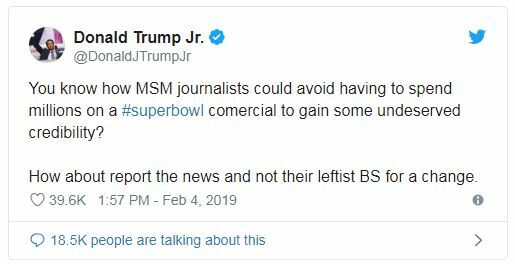 Donald Trump’s son, Donald Trump Jnr, wasn’t as impressed as shown in this tweet. I think that is high praise myself.